Started in 2011 by brothers Javier and Victor Badillo, Caracas plays Latin-influenced punk rock that has been compared with the Talking Heads, Santana, Gogol Bordello and Pixies, among many others. Their lyrics share the immigrant experience and the Venezuelan struggle, delivered in big party anthems and intimate "sonadas" (Latin waltzes) on a Cuatro guitar (a Venezuelan ukelele), all adding up to a thoroughly entertaining live performance. Caracas new EP "Bring on the Playtime" (Spring 2016) was produced by South African-Canadian producer Dylan Ellis (Hokum, Rami Lakkis), and was recorded in Vancouver's iconic Fader Mountain / The Farm studios and at DeVille Studios, tucked in a small East Vancouver neighborhood. 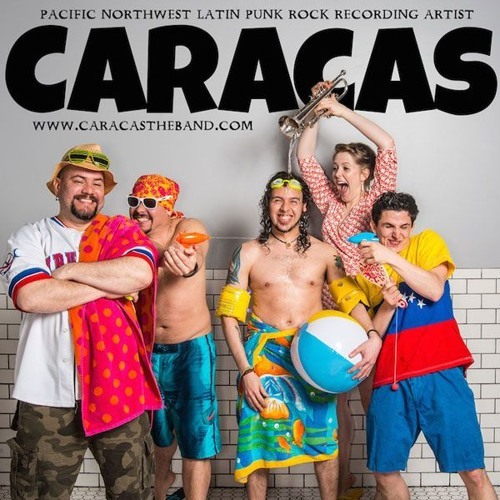 The songs take the band's most popular tunes from the past five years and turns them on their head, showcasing the evolution of Caracas from a two-piece garage band to a five-piece Latin rock party machine! A music video for their new single "Bring on the Playtime" (2016) directed by Shaun Walford is now online: https://www.youtube.com/watch?v=4fKiRCvYYHs Their single "Bring on the Playtime" is the theme song for the new microbrewery doc webseries "Vancouver On Tap" (2016). A number of their songs are featured in the independent movies "The Cover-Up" (2013) and "Naked Night Bike" (2014). Caracas performed on Vancouver's Shaw TV Channel 4 for "Canadian Sound Arts Therapy Show", a community-driven show. The episode originally aired in the spring of 2015. In June 2015, Caracas was invited to perform on the World Beat Stage of the 27th Annual Rio Tinto Alcan Dragon Boat Festival, the largest of its kind in North America! Caracas is an active member of SOCAN, ASCAP and BMI, managed by Vancouver-based Dead Straight Music Publishing.